Yap is located in the western Caroline Islands, today part of the Federated States of Micronesia, about 850 miles east of Mindanao in the Philippines. This small island came under the control of Spain during its Age of Exploration and served as a source of copra  dried coconut meat from which coconut oil is extracted. The Germans purchased Yap in 1899 as a potential cable station and part of the effort to encircle the globe telegraphically. With the outbreak of war in 1914, Yap was one of a number of German possessions seized by the Japanese. At the Paris Peace Conference (1919), U.S. president Woodrow Wilson pushed unsuccessfully for the internationalization of Yap, which in the end was awarded to Japan as a mandate. The United States mildly protested that decision and asserted its own claim to the area. Despite the considerable commercial interests that were at stake, the American press had great fun with the issue, finding many rhymes for the word Yap. Accommodation on Yap was reached between Japan and the United States in February 1922 at the Washington Naval Conference. 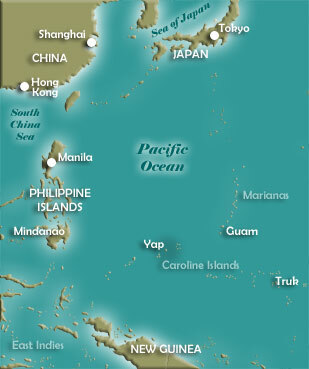 Yap was used by the Japanese as an air and naval base during World War II, before falling to American forces. In 1947, the Caroline Islands became part of the Trust Territory of the Pacific Islands under United Nations auspices and administered by the U.S.
Yap became a state in the Federated States of Micronesia in 1979 and achieved independence under a Compact of Free Association with the United States in 1986.